OmniConverter multi-port media converters with Power-over-Ethernet (PoE) enable distance extension over fibre for PoE Powered Devices (PDs). Classified as Power Sourcing Equipment (PSE), PoE media converters can provide power to one or two PoE Powered Devices using standard UTP cables that carry the Ethernet data. OmniConverter media converters support IEEE 802.3af PoE (15.4W), IEEE 802.3af PoE+ (34.2W) and up to 60W PoE. They also support dual or single RJ-45 ports, dual or single fibre ports, and 10/100 or 10/100/1000 data rates. 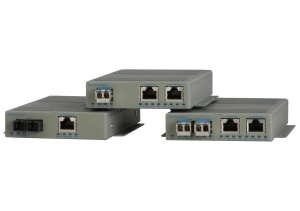 OmniConverter /S and /SL models support single or dual RJ-45 and fibre ports, and provide several advanced features that can be configured with DIP-switches. Configurable features include link fault propagation modes, and a PoE power reset function that enables a PD device to be re-initialized remotely. OmniConverter /SE models have a smaller form factor, and provide a cost-effective alternative for applications that do not require advanced features or dual fibre ports. There are no DIP-switches for simple, plug-and-play installation. All OmniConverter media converters can be table top mounted, wall mounted, or DIN-rail mounted using an optional DIN rail mounting kit. They can also be mounted on a 1U 19” rack-mount shelf. They are available with DC input power via terminal connectors or external 100 to 240V AC power adapters. 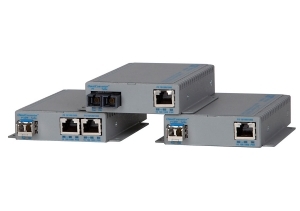 The OmniConverter GPoE/SE and GPoE+/SE are cost-effective, multi-port media converters that convert 10/100/1000BASE-T copper to 1000BASE-X fibre and support Power-over-Ethernet (PoE and PoE+). Classified as Power Sourcing Equipment (PSE), they can provide power to one or two Powered Devices (PDs) using standard UTP cables that carry the Ethernet data. The OmniConverter functions as a PoE mini-switch, and supports single or dual RJ-45 ports. The OmniConverter GPoE+/SX is a multi-port media converter that converts 10/100/1000BASE-T copper to 1000BASE-X or 100BASE-X fibre, and support Power-over-Ethernet (PoE and PoE+). OmniConverter PoE media converters provide network distance extension with fibre cabling, and function as PoE injectors providing power to four Powered Device (PDs) over standard UTP cables that carry the Ethernet data.